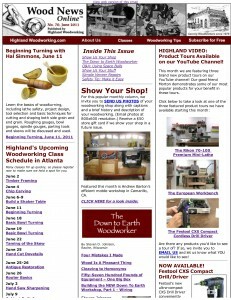 This month’s issue of Highland Woodworking’s Wood News Online is available, and we’ve included all sorts of great deals, interesting stories, and of course a lot of informative tips for you to help you with your own woodworking. Featured in our Show Us Your Shop column is Andrew Barton’s innovative mobile workshop, a concept he designed himself that allows him to pack up small at the end of his woodworking day so his wife can still park her car in the garage! We’ve also got some truly impressive craftsmanship by a husband and wife couple, Glen and Pat Bond, in this month’s Show Us Your Stuff column, as well as a sage safety tip brought to us by Tom LeRoy. All that plus the Down to Earth Woodworker is back this month with more captivating stories, including his inventive plan to house his entire workshop in a storage container while he finishes getting the space set up. With three new video product tours, our Youtube channel is a great place to go to learn more about many of the great products available at Highland Woodworking. This month we feature a video tour of the brand new Festool CSX Drill. Wach it and then get yours today! All this, and MUCH more, in the latest issue – go take a look at it now, and enjoy! February 2011 Wood News is out! The September edition of Wood News is out! The Plane Facts: Using a Scrub Plane Woodworking Tool Video Tours: Festool CXS, European Workbench & Rikon Mini-lathe featured this month!